Messana Radiant Cooling panels were installed in the new Eden Hall campus (South Building Dormitory). The three floor building has two wings (East and West) and about 90 rooms. When the Team arrived on the job site (Monday June 29) drywall tapers were still finishing some of the panels in the entrance of the building. 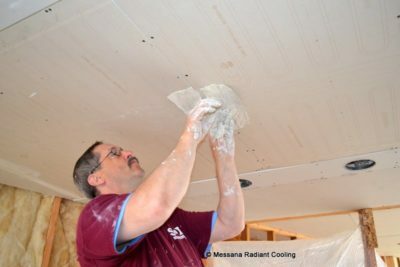 In the picture the taper is applying the “half moon circle” (drywall circular patches) that cover the connection windows of two adjacent Ray Magic panels. The Messana Team (Maurizio Donadon, Greg Cross and Alessandro Arnulfo) worked for seven consecutive days to complete the wiring of the control panels (one panel per each floor plus one panel in the mechanical room located in the basement) and start up the radiant ceiling system for the first time. The team operated with the remote assistance from Italy of Andrea Ferrarelli and Federico Michilini who spent over four nights programming the system and completely testing in all its functionality. Each panel controls 12 different mix-pump stations (4 for each floor, 2 per wing of the building). At the mix-pump station the thermal fluid temperature is modulated by the mixing valve and is sent to the manifold. 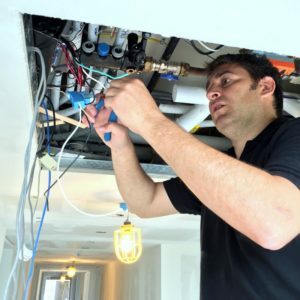 Each loop of the manifold is equipped with a thermal actuator for zoning different student rooms and common areas (96 in total). 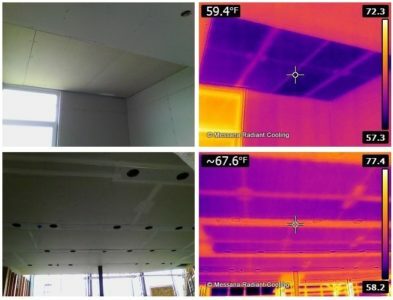 In the picture on the side there are some digital and infrared views of the Ray Magic radiant gypsum panels of the first floor building installed in the hall and a typical student room. Panels are tested in cooling mode with supply water temperature of about 50F (purple color). The radiant cooling system was started during the weekend of July the 4th (2015) when the building was completely empty. 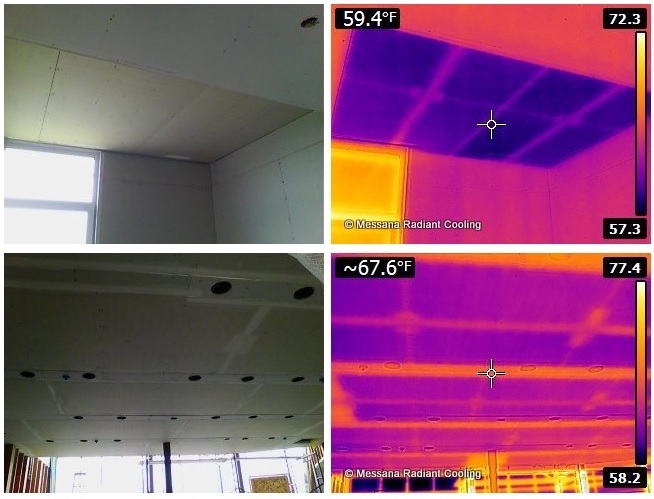 The first tour of the building with the infrared camera is always very exciting… you can clearly see all the radiant panels and how the radiant fluid flows. As soon as the radiant cooling system is started you can immediately feel the cooling effect of the radiant ceiling. Interesting stuff.. I didn’t know we are doing this kind of building in the US. Is this really going to work? I’m always been intrigued by this radiant cooling system but never had a chance to try one. What kind of performance is expected for this system? How do you deal with the condensation? We have an advanced control system (Control Magic) with Temp and Humidity sensors. One per room and common area. In simple words: the control system estimates the radiant panel surface temperature and by modulating a mixing valve adjust the temperature of the supply water to maintain the radiant panel surface temp 1-2F above dew-point. The mechanical contractor is Tudy Mecchanical (www.tudi.com).